A pivotal day in the AutoFlick chronology marking the end of part one. Izzy and Speedy are canoeing the Delaware River below New Hope when a 1968 Correct Craft Ski Nautique approaches, towing a water skier. Facing downstream again, I saw on the river’s horizon a speedboat towing a water skier. It’s a big enough river and there was plenty of room for others, but from the stern of a canoe they seemed like a distant, noisy intrusion. The speedboat was plowing straight up the river; the water skier was making wide, lazy turns, slaloming out from behind the boat from one side to the other. They were heading toward us. I held my line, determined to exert my right of way as the downstream vessel and the one without power. I wondered if the speedboat driver had read the same chapter. My father suddenly turned around and sat up in the bow seat, taking up his paddle. The speedboat began to make a sweeping right turn in front of us, still at a safe distance, its engine crowding into our quiet. Suddenly the skier slalomed toward her right, her orbit coming as close as it would to our path. I recognized the swimsuit first. I glanced from Juliana to the captain of the speedboat. A man of impeccable timing, Vic Martine flicked a cigarette from the boat into the river and finished his turn back downstream. 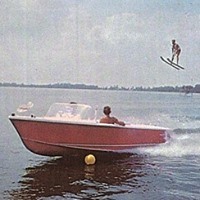 It was a 1968 Correct Craft Ski Nautique, a top-of-line water-ski boat in those days. There were two other people in the boat whom I did not recognize. “Hey!” my father yelled, pointlessly, at the retreating wake of the speedboat pulling Juliana, skipping across the waves, a bauble of gushing, youthful beauty in a bathing suit, her hair flying behind her. “It’s Juliana, and that guy who wants to build a subdivision on the canal,” I said, unsure whether he heard me. “All the more reason,” said Speedy. I wasn’t so sure, considering that the pursuit of whales is always under great and extraordinary difficulties, that every individual moment comprises a peril. But I shrugged, knowing there was no way we could catch them. My father turned determinedly to the task and began digging relentlessly into the water. I had to switch sides to balance his enthusiasm. It took a few dozen strokes before we found a sustainable rhythm and the canoe began to track. This was not the kind of lazy paddling my father and I usually did; it was committed, like a distance runner escaping the totalitarian north, keeping stride and mowing down the fathoms. A sunny summer afternoon kind of lunacy and I liked it. Our poetic craft bearing purple stars and popcorn didn’t feel slow anymore, though Martine and Juliana were soon enough specks on the downstream horizon of the river. Chasing ghosts, we were a live, two-cylinder human engine churning down the river. My father was the muscle, planting and pulling long, even strokes that made it easy to match his beat, skipping one stroke every once in a while to keep us trimmed just off line into the gentle wind sweeping on to us. We probably paddled 10 minutes without hesitation and I think we might have gone right past my mother and sister if they hadn’t started calling us from the riverbank. With some resignation, my father stopped paddling and rested the shaft across the gunwales in front him, as I redirected us toward the shoreline.